Hello there everyone, my name is Roxana I'm 20 years old and I'm the mother of 8 months old Dominic, I'm looking to raise enough money to buy a house for our soon, we have had a difficult leaving we have dah a hard life and we want to have a better future for our Dominic, we want to buy a house for his well being. 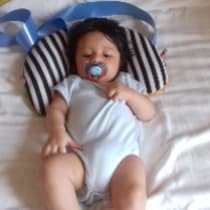 Hello everyone my name is Roxana I'm 20 years old I'm the mother of 8 months old Dominic, we are having financial difficulties as only my boy friend is working alone and money are not much, rent is very expensive and we don't afford to be renting a property. and for your donations every little helps. we grown up in a foster home and once we have turned 18 years old we have been asked to leave the foster house and both of us left our own country and travel around Europe countries trying to find a better life for us and our future children at that time, now we have a 8 months old baby boy called Dominic the most beautiful child in the world, we are not blaming our parents for leaving us, we tried to understand that maybe they haven't been abel to look after us and they ended up leaving us in the foster home. we are trying to not make the same mistake they did with us when they have left us, even we are having difficulties in life and is not easy but we are not going to give up our gorgeous boy which is a blessing from God. Please help us with any amount of money you can so we can reach our asking amount and maybe with Gods mercy we will buy a house for little Dominic well being and education. we are happy and we will be grateful for any donation so please don't hesitate to make a donation for giving a child a chance for a better future thank you and God bless you all.